Since March, Shannon Horst has been serving as the senior pastor of Basore Road Grace Brethren Church in Dayton, Ohio. Shannon grew up in rural eastern Pennsylvania. After graduating from high school, he took some time to work and save money for college. However, this isn’t how things worked out. Years past and he met his wife, Stephanie, who was at that time attending Lancaster Bible College. 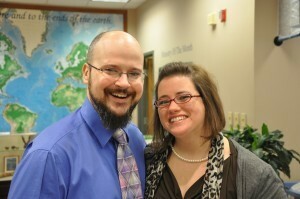 Soon after the two were married, Shannon enrolled in LBC in their Pre-Seminary program. His time at Lancaster Bible College wasn’t easy. Since he held a full-time job and was a newlywed, he could only take one class at a time. This caused Shannon to appreciate his education even more. All through school Shannon became more and more convinced of the call the Lord placed in his life. He has been active within the Fellowship of Grace Brethren Churches in various ways and loves the joys and challenges that ministry has to offer. Shannon now lives in the Dayton area with his lovely wife and four children.